In the July 19 runoff for the special election to fill the vacant seat in the 113th, Williams got 62.4 percent of the votes against Democratic candidate Dan Matthews. That was in a district that split its vote in the 2010 gubernatorial race 65.6 percent for Republican Nathan Deal and 34.4 percent for Democrat Roy Barnes. Voters in the new district that will replace Williams’ current district gave 58.2 percent of their votes to Deal, who was elected governor, and 41.8 percent of their votes to Barnes, according to data released by the legislative reapportionment committees last Friday. I dropped the relatively small vote for Libertarian John Monds in both computations. The 113th District, which Williams represents, currently is dominated by Oconee County, with 59.9 percent of the registered voters. Another 24.6 percent come from Clarke County. Oglethorpe County contributes 9.7 percent, and the remaining 5.8 percent are in Morgan County. In the proposed 119th, Oconee County has 49.8 percent of the registered voters, with Clarke County having the remaining 50.2 percent. What is more important, the current five precincts in Clarke County that contribute voters to the 113th are spread around the fringes of the county in three noncontiguous areas, weakening their influence. In the proposed 119th, the Clarke County voters are more tightly clustered and more at the heart of the city and its life. The proposal calls for the 119th to include Clarke precincts 1C and 1D, both in the south of the county and currently in the 113th. But it also would include Precincts 7C, 8B, 8C and 4A, which stretch from the Middle Oconee River to Ben Epps Airport. The 119th also would include major parts of Precinct 4B, including most of the University of Georgia campus. And it includes the southern tail of Precinct 7A. The district will require Williams or whoever runs in 2012 to spend more time campaigning in Clarke County than was necessary in the July 19 runoff or the June 21 first round of voting. And it also will require more spending on advertising in the more expensive Clarke County media. The candidates in both the June 21 and July 19 elections spent most of their money in Oconee County, according to their campaign finance statements. The General Assembly is redistricting to accommodate population changes reflected in the 2010 Census. On Friday, the House and Senate reapportionment subcommittees released their proposed maps and supporting documents. The House committee favorably reported the proposal to the full House yesterday. The Senate proposal does not change Oconee County’s status as falling completely in the 46th Senate District. The House plan includes major changes to the three districts that fall in Clarke County. The gross maps released on Friday showed the general patterns of those changes. Three precincts from northern Oconee County–Bogart, Malcom Bridge and Athens Academy–are carved from the 113th to join with precincts from Barrow, Jackson and Clarke counties to create a new 117th District. That district replaces the current 115th District, which now falls entirely in Clarke County and is represented by Doug McKillip. McKillip was elected to the General Assembly in 2010 as a Democrat but switched to the Republican Party before the session started this January. The 114th, represented by Democrat Keith Heard, also was changed, though less dramatically. It becomes the 118th District. The 113th is eliminated (that number will be used for a district in Newton and Rockdale counties) and replaced with the new 119th. The reapportionment subcommittees released data at the level of the precinct from around the state and data describing the characteristics of the proposed districts. The subcommittees also released a Google Map, which is difficult to download and view but shows district lines for each of the 180 House districts and 56 Senate districts. I traced those maps against detailed maps of precincts in Oconee and Clarke Counties to determine the nature of the changes proposed. The Oconee County precinct maps are easy to read. The Clarke County precincts are much more complex and more difficult to match against the maps released by the subcommittees. Examination of the maps, however, shows the drastic nature of the changes made to create the new 117th District for McKillip. The division of Clarke County Precinct 4B gives to District 119 the UGA campus but keeps for McKillip the residential area to the east. McKillip lives at 135 University Drive in that neighborhood. Legislators must live in the district they represent. McKillip also got the parts of Precinct 7A not assigned to District 119, and all of 7B. Both had been in his old 115th District. 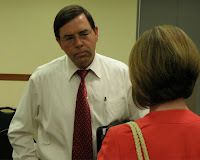 He picked up all of Precinct 6B, most of which had been in the old 113th District. The other part had been in his 115th District. McKillip also was given Precinct 6A, which includes the Clarke County part of Bogart. That precinct had been in the 113th. McKillip’s new 117th also got Precinct 6B, Precinct 6D, and Precinct 3A, all of which had been in Keith Heard’s 114th District. In the process, McKillip got a district that is heavily Republican. In 2010, 57.2 percent of the voters in the new district voted for Gov. Deal, according to the data released by the subcommittees. In contrast, McKillip’s old district, according to the voting records I analyzed, gave Deal only 40.3 percent of its vote. Again, the votes for Monds have been removed from the calculations. At present, I live in the 113th represented by Williams, and I work in the 115th, represented by McKillip. After the district changes, which Oconee County officials at least feel is a done deal, I will live in the 117th District and be represented by McKillip. But I will work in the 119th, represented by Williams. NOTE: An earlier version of this report did not include precinct 8B in those that will be included in the 119th District. It also mistakenly labeled Precinct 4A, which includes the Ben Epps Airport, as 8A. I apologize for missing the jog in the Google map and misreading the Athens-Clarke County precinct map. Looks like a portion of Oconee County could wind up being represented by a Democrat from Clarke County, especially if enough of us stay mad at the Republicans for splitting the County. The right Dem. could win. McKillip's party switch happened within hours of being elected. Your wording seems to try and skew this fact. I think your bias is showing.